OMEGA™ pH and ORP differential probes stay in service and provide accurate measurements under conditions that often render conventional pH probes inoperable. 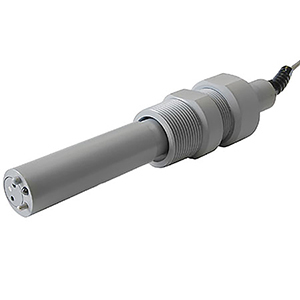 These probes, come with an integral encapsulated 4 to 20 mA 2-wire transmitter to feed directly to a PLC or a DCS. The PHETX-600 and ORETX-600 probes employ a differential measurement technique. Unlike conventional combination probes, the differential probe has two high impedance measurement circuits containing a common metallic return electrode. One circuit includes the process measurement electrode which generates a potential E1 proportional to the process pH. The second circuit includes an internal measurement electrode immersed in a stable buffer solution which generates a standard reference potential, E2. Both circuit share a common potential E3 developed at the return electrode. The two circuits are fed into amplifiers which provide an output representing the differential between them: (E1 - E 3)– (E2 - E3). The common potential E3 is cancelled out electronically, greatly reducing inaccuracies caused by ground loops which may exist between process and instrument grounds. Ground loop current will flow through the low impedance path of the return electrode, affecting the potential E3, but not the differential measurement. The differential probe maintains its accuracy and stability in aggressive process applications long after a combination-style probes performance begins to deteriorate. Maintenance costs are reduced and the life of the probe is increased. The internal reference electrode is electrically connected to the process solution by means of a field-replaceable double junction salt bridge which greatly reduces the possibility of contamination of the buffer solution in the reference circuit. Although seldom required, the reference solution may be easily replaced by removing the screw-out salt bridge. A salt bridge and buffers are available for this purpose. Another advantage of the PHETX/ ORETX-600 series are the semi-flush face which is easily cleaned and avoids solution materials gathering on protrusions found in other probes. The domed glass electrode, the protective metal electrode and the temperature sensor protrude only about 1⁄8" while the salt bridge is flush. A flat-face version of the pH probe is also available. The PHETX/ORETX-600 series is available in: 1½ NPT threaded body style (-600), “easy-in, easy-out” variable insertion depth version with 1¼ NPT compression fitting (-610), or the hot tap version (-620). Temperature Limits (CPVC): -5 to 95°C (23 to 203°F) the temperature limit of probes in flow through applications is limited by pressure and by the pipe fitting material. Note: Comes complete with electrode, salt bridge and operator’s manual.